Recep Tayyip Erdoğan, President seemingly for life of Turkey has thrown the gauntlet down at the feet of the European Union (EU) demanding immediate action on Turkey’s demand for visa free travel throughout Europe from Turkey. With the onslaught of Islamic refugees emanating from within Turkey, it is little surprise if the EU is even the slightest bit hesitant to grant Turkey open borders with the numbers of refugees still residing in camps in Turkey. If this were the sole aggrandizement coming from President Erdogan it might be excusable, but there’s more. Erdogan has also expressed desires for Turkey to take steps, modest steps, but steps in reforming the Ottoman Caliphate. 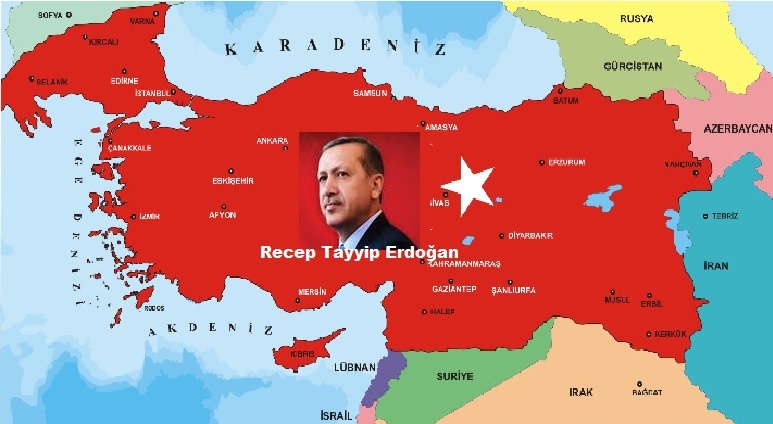 He has set his desires on incorporating Aleppo and Mosul into Turkey and expanding his borders southward taking areas of lands formerly part of Iraq and Syria and incorporating all the Kurdish lands into Turkey. One might ask what would happen to the Kurds as the relations between Turkey and the Kurds has been rocky at best. This is where things begin to resemble the darker periods of Turkey’s history. The military incursion being executed currently by Turkey presumably to fight the Islamic State in Syria has been cover for their real intentions, eradication of Kurdish Peshmerga Militias and their other protective services. The actions by the Turkish military in Syria and suspected coordination in northern Iraq has been to ethnically cleanse the Kurdish areas in a similar manner as their historic Ottoman treatment of their Armenian minority population. The Armenians were a Christian minority residing in the northern areas of the Turkish Ottoman Empire who met a fate very similar to what the Yazidi faces at the hands of the Islamic State. What makes this threat to the Kurds all the more tragic is it was the Kurdish forces which rescued what Yazidi they were able to reach preventing a complete genocide of the people and now the Kurds may be facing a genocide themselves if they do not receive protection from forces capable of preventing the Turkish offensive against them. The first step would be the media and world governments actually recognizing the Turkish intentions for expanding their borders and eradicating the Kurdish peoples residing in northern Syria and Iraq. Unfortunately the Russians are fighting to save Bashir al-Assad and allied with Iran in this Syrian multi-front war and the Kurdish are not on the same team. What makes all this even stranger is the Kurds are not actually fighting Assad as much as they are simply defending their people from multiple threats. Assad and the Russians currently have no front where they are contending with the Kurds and unless they choose to fight the Kurds there would be no contention. The Kurds have been the odd group out in the entire Syrian conflagration as their main intention has been to protect their own population from all outside forces. They have received limited assistance from any of the major powers and their main assistance came from what many might call the most unlikely of places. We will leave that for others to reveal should they so choose. Their main problem is they border a Turkey under leadership which imagines themselves the new Caliph and envision returning to their vision of a renewed Turkish Empire eventually on the grand scale which was the Ottoman Empire at its peak of power and expanse. The world is going to need to awaken and realize that there are still forces which believe they are destined by their deity to rule the world. Granted they will spend much of their time fighting one another for supremacy and once Europe has been subsumed there will be new leaders with the vision of world conquest rising from these new fronts. These threats are real and need be addressed through some means by the rest of the world before such dreams become everybody’s nightmares. Today the main nations whose leaders envision world conquest are limited to Iran and Turkey but one must also figure for the Islamic State and Muslim Brotherhood who have their own plans for world conquest. The world had thought after defeating the Nazis and the fall of the Soviet Union’s empire, that world conquest as a viable concept had been defeated once and for all. Unfortunately that conclusion appears to have been premature as there remains another group who believe the world was made to be their apple to do with as they please and all must bend to their will. Until Islam has realized that their dream is everyone else’s nightmare and will eventually be recognized and their dreams of world conquest will bring ruin upon them and that their only choice will be accepting that others have rights to believe and live as they please. Until that day there is still a great threat in this world which need be remedied and the sooner the better. The first step might be the EU turning the Turkish request down cold and demand they have Visas to enter Europe; otherwise close the border. Unfortunately it will take new leadership across Europe before they will stand on principle. That can only lead to greater difficulties in the very near future. Where are the leaders for tomorrow or is there to be no tomorrow? The greatest colonial force in the history of humankind is again on the march. This colonial system has expanded reaching beyond the size if not scope of the great European empires of France, Spain, Portugal, England and the rest. This expansionary force has reached beyond the scope of all systems with the exception of Communism and is now ascending as Communism collapses in Europe and Russia. This expansive colonial force is, of course, Islam. Islam is not actually a religion as much as a weaponized political force wrapped in the shroud of an all-consuming religion. Islam is perfectly named and correctly translated to English meaning “Surrender.” That is exactly what Islam requires and Sharia is the force used to demand the complete turning over of one’s existence to Islam. All free will is surrendered. All curiosity is surrendered. All of one’s society and way of life is surrendered. Islam demands that it be granted all power over every act one will be permitted from the moment Islam assumed full influence in an area. Islam empowers the cult of personality placing the most successful Imam as Caliph, and the greatest Imam is that which has conquered the largest number of minds into blind obedience into every interpretation given of the Quran. Inside the Quran is the secret magic of Islam and Sharia. The Quran contains verses placed in order not chronologically, not by importance of highest to lowest or lowest to highest, but from shortest to longest. The Quran is assembled in a manner which lends to its being memorized starting at the earliest of ages. Thus Islamic education takes over the entirety of the education system into which it plants memorized verses. It is then the privilege of the Imam to exemplify and amplify by their teaching those verses which are dominant and those which are of lesser standing. This too lends itself to a means of conquest. Islam can be all things to all peoples simply by expressing certain verses as superceding all other verses. This lends perfectly to the use of Taqiyya which is using deceit to gain advantage and for the sole implementation of Sharia. The implication of Sharia is the ultimate goal of Islam as once Sharia has been imposed on a society, Islam will inevitably become the sole religion and further, only the manner of Islam practiced by the main body will result in the only permitted form of Islam. In the world today that would mean that Sunni Islam is dominant. Even this realization still leads to an eventual conflict between the main proponents of Sunni Islam, Wahhabi Islam or the Muslim Brotherhood Islam. Reading the Quran one will inevitable discover that there are verses which are contradictory where there are a set which preach acceptance and peaceful coexistence and still others which dictate conquest and submitting any native population forcing conversion or death choices and still others which direct exactly how one is to live one’s life. There are the obvious religious teachings such as prayer five times each day, observing Ramadan fasting, giving of alms, making of the Haj to Mecca in one’s lifetime and the acceptance of Allah and Muhammad as Allah’s messenger on Earth as the final revelation. 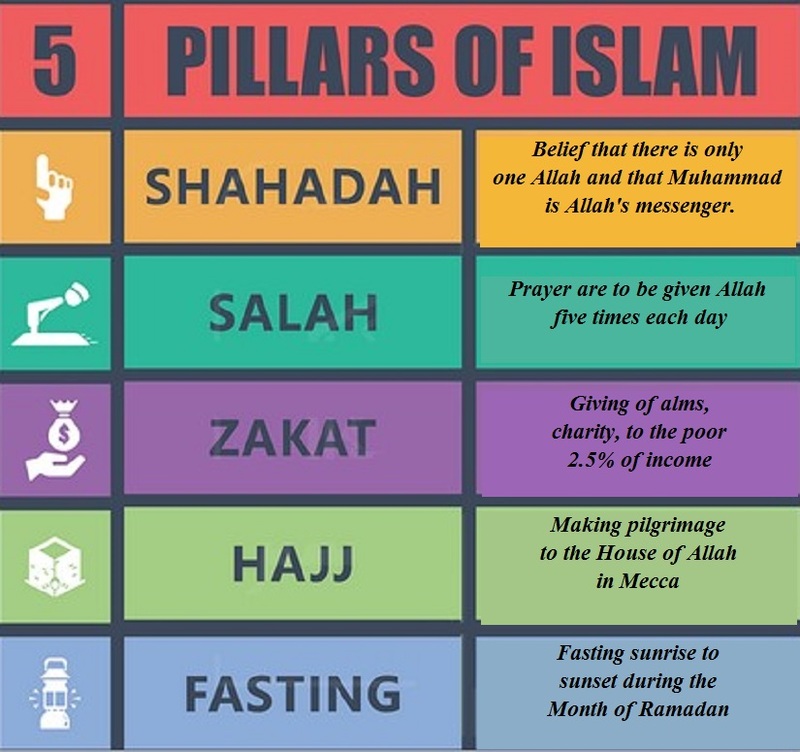 These five laws are called the “Five Pillars of Islam” pictured below. Additionally the Quran teaches what foods are acceptable as Halal and numerous other requirements of Islam. Beyond these basics are the two sets of verses which are obvious in their differences. The two obviously contradictory verses within the Quran are the Mecca versus preaching peace, acceptance, pluralism, respect for other religions and even recognizing the Promised Lands as belonging to the Jewish people. Then there are the verses demanding conquest, subjugations and the eventual complete absorption of a society by force if required which were recorded in Medina. An introductory explanation can be found here. Suffice it to say these different and opposing verses are implemented such that Islam slowly builds until reaching a critical point at which it conquers. Islam has attempted to conquer Europe at a minimum twice, once from the west and once from the east. The western offensive was eventually halted in the Battle of Tours where the Frankish forces commanded by Charles Martel who was also known as Martellus (“The Hammer”), who defeated the Muslims of the Umayyad Caliphate advancing out from Spain in October 732. The Battle of Tours was known to Islam as the Battle of the Palace of the Martyrs (Arabic: معركة بلاط الشهداء‎‎, transliterated as ma’arakat Balâṭ ash-Shuhadâ). This turned back the Islamic armies who were later driven from Spain starting with the Spanish reconquest and the imposition of the Inquisition to cleanse the Spanish of any remnants of unbelievers, mostly Muslims and Jews. This was a cleansing by the Church to reestablish their dominance after recovering from Islamic conquest. 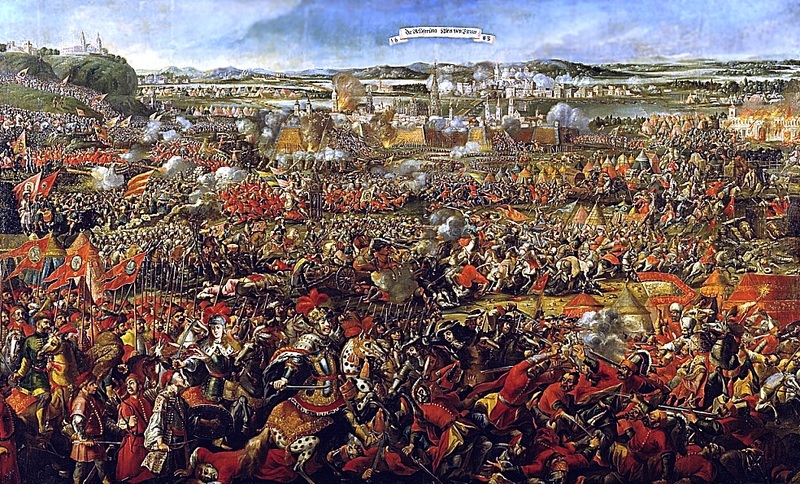 The conquest from the east was turned back at Vienna in the breaking of the Siege of Vienna on September 11 through 12, 1683. This battle pitched the Ottomans against the Holy Roman Empire and was subsequent to the fall of Constantinople in 1453 and its being renamed Istanbul to erase its history in Christianity and Roman, Greek, Persian and even earlier civilizations and empires going back originally in the first known empire of the Hittites. The breaking of the Siege of Vienna was largely accomplished by the addition of the Polish forces to those of the Holy Roman armies and the commander, the King of Poland leading the troops himself, King John III Sobieski. The battle was depicted by an anonymous British artist shown below. This was the high watermark of the Ottoman Empire’s thrusts into Europe. The Ottoman Empire was finally defeated as a result of World War I leading to the Sykes-Picot Treaty, Treaty of Versailles, and the Treaty of Sèvre which codified the San Remo conference and the Mandate System subsequently recognized by the United Nations in Article 80 of the Charter. Islam originated in the Arabian Peninsula by the Prophet Muhammad starting around 611 to 625 in Mecca and finally truly established in Medina around 629 establishing it in both cities until his death in 632. 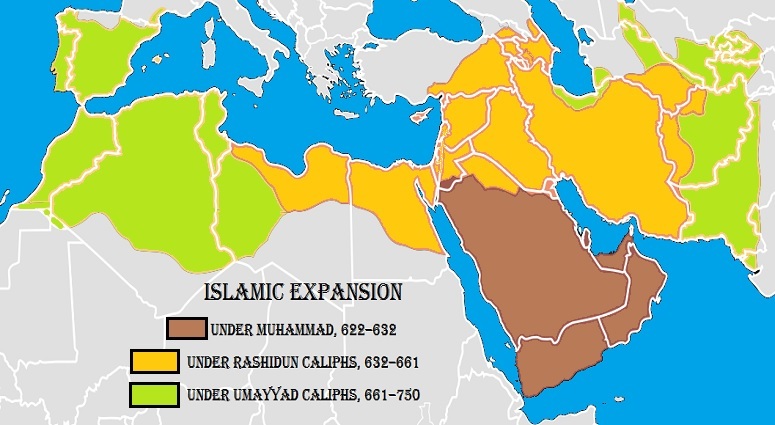 This led to the Rashidun Caliphs who ruled and expanded Islam from 632 through 661 and were succeeded by the Umayyad Caliphs ruling from 661 through 750 and expanding Islam further taking it into Spain finally halted by Charles Martel in 732 as noted above. A map depicting these early advances can be seen below. The early expansion would continue to include subsequent conquest of Constantinople and under the Ottomans conquer up to Vienna where they were stopped and repulsed by the Holy Roman Empire aided by the support of the Polish Army and the combined troops commanded by King John III Sobieski of Poland, also as noted above. Islam in the Middle East and much of North Africa is currently engaged in a great political upheaval which will likely spell the end of the Sykes-Picot Treaty’s borders and set up of states to be replaced either by tribal boundaries or possibly a unified Islam likely broken into two camps, the Sunni and the Shiite. The Shiites will most definitely be under the control either directly or indirectly by Iran and will include Yemen, western Syria and potentially central Syria, Lebanon and Southern Iraq. The Sunni Islamic camp will include as separate but potentially allied Egypt and Saudi Arabia with each under strong leadership and the partnership always slightly tentative between these two. Saudi Arabia and Egypt may include Turkey though Egypt and Turkey are currently at odds over loyalty or opposition to the Muslim Brotherhood. Jordan will remain a lesser player probably seeking shelter under Egypt or Saudi Arabia if not both. Jordan also has a delicate balance with the Muslim Brotherhood with their allowed a presence but not overtly ruling the country. Then there are the Kurdish forces which have been showing signs of joining the radical jihadi forces but on their terms. This will depend on the Kurdish forces currently engaged by Turkey surviving the Turkish offensive bent on wiping them out as a viable fighting force. This has led to some friction between Turkey and the United States who was serendipitously supplying the Kurds with bombing support and some logistics and planning. The one obvious challenge to all Sunni forces is the Islamic State which has terrorist bands in the Sinai Peninsula and Libya as well as their main body centered in southern Syria and into central Iraq. The Islamic State is currently opposed by all state actors who are refusing to grant the Islamic State leader al-Baghdadi who is a self-proclaimed Caliph and insisting that the Islamic State is the new Caliphate, something which remains to be seen. The advance guard of the Islamist forces are currently infiltrating the Western nations as a part of the “refugee” crisis which has Europe, the United States, Canada and Australia allowing increased immigration with minimal if any checks on any Middle Eastern or North African claiming to be refugees from any of the wars currently embroiling much of the area. These refugees include Syrians, Afghanis, Iraqis, Iranians, Yemenis, Libyans, Algerians and others from as far as the Horn of Africa to Morocco back across to Pakistan. Imbedded within the refugee population are teams of Islamists, both Sunni and Shiite largely from Iranian Revolutionary Guard Corps (IRGC) and Hezballah on the Shiite side and Islamic State, Muslim Brotherhood, al-Qaeda and smaller groups on the Sunni side. All these planted groups plus unknown numbers of Muslims who are being excited by the signs of a resurgent Islam are taking on themselves the mantle of jihad and attacking in what are call “Lone Wolf” attacks. The violence and lawlessness which has come along with the predominantly male fighting age single unaccompanied men has led to some second thoughts across Europe. Sweden is paying undocumented Middle Eastern refugees money to leave and presumably return to their national origins in the Middle East, or at least appear to be heading in that direction. Some Eastern European nations simply refused to allow any refugees to permanently remain within their borders with some places the military at the train stations forcing the refugees to continue on to Germany, France, Britain or anywhere but “here”. Russia has pretty much been bypassed as a nation for the refugees. The biggest scandal has been the entire Islamic world refusal to accommodate resettling any of the millions of refugees. Turkey and Jordan have been stymied by the hordes crossing from Syria and Iraq simply to escape the wars in those nations. Quietly Israel has provided aid to Jordan in the form of additional water and electricity to assist the refugee situation. Whatever additional aid has been provided is uncertain. On another front the Islamic State is serious about their becoming the next Caliphate and is fighting against Saudi Arabia and Egypt as well as throughout the remainder of northern Africa. Further, terror groups including Boko Haram in Nigeria and neighboring nations and some groups formerly tied with al-Qaeda also have sworn allegiance to the Islamic State. The main problems with these forces have been in the Sinai Peninsula and have been aided as possible by Hamas in Gaza. This has made for a strange cooperative effort by Egypt and Israel in sharing intelligence and closing all borders over land and sea by both nations to prevent military and dual use items from being used by Hamas as much as they are capable. Hamas has stolen, re-appropriated if you insist, the building provisions such as bricks and cement and concrete for their tunnel construction to infiltrate into Israel or the Sinai. This has had the strange effect of a world demanding that more building provisions be sent into Gaza despite the known misuse. Apparently building tunnels with humanitarian aid is just fine with much of the world providing those tunnels are used to murder Israelis. So nice to be appreciated in this manner, we bet! Meanwhile, the numbers and severity of crimes, many of which could be termed as Jihadic or terrorist attack, have been exploding across Europe with concentrations in Germany, France, and the Scandinavian nations, the places which took in the largest share of Muslim refugees or had large Islamic populations to begin with. One systemic problem has been the radicalization of the younger indigenous Muslims by the instigators planted within the refugee populations. By all appearances, what had been considered to be the peaceful Muslims, the good Muslims if you will, only need be aroused and pushed, perhaps threatened to join jihad or else and they appear to respond, at least a percentage. There will be those who will rightfully point out that the problems are caused by a minority, anywhere from negligible (obviously the low estimate) to as high as one in five or even in four but not quite three, or so we hope. Still, twenty percent of three or four million refugees is still well over half a million persons and add in the “Lone Wolves” and you are likely approaching a potential of three-quarters of a million threatening social cohesion which had been low to begin with. Seven-hundred-fifty-thousand jihadists will overwhelm European and western society’s ability to cope with such a threat. These are just the initial wave as the refugees are still pouring into eastern Europe heading northward and westward aiming for Germany, France, Britain, the Scandinavian countries; anywhere that a strong social basket is deployed giving what amounts to a guaranteed wage for all persons reaching and registering with the government no questions asked. The problems in Germany alone appear to be sufficient that Chancellor Angela Merkel appears to be on her way out of office come the next elections no matter what the future holds, as the people are furiously upset with her open borders policies. Should Donald Trump win in the United States, his election will in part be all about closing the borders, all the borders including those currently used by the State Department to import as many Islamic refugees as humanly possible. The most interesting and important item is that very few of the refugees are Christians or Yazidis, people truly under threat just remaining in the Middle East and North Africa. It is as if these refugees are not desirable and the few who manage to arrive in Europe are often murdered in the camps by the other refugees. One would think that the Christians would identify themselves as such to the Europeans and they would be separated out but maybe the European powers that be are not interested in importing devout Christians, Christians who have resisted unknowable hardship that Western Christians have never faced. Western European Christians face a different threat, indifference and a strong societal urge for hedonism. We know from past empires failing that when the public turns as a whole to hedonism as their life’s theme the society will die within two generations at most, often in one generation. Perhaps these two symptoms go together one causing the other. Hedonistic society not reproducing as that would curtail the fun and thus requiring immigrants to replace the children they refuse to have of their own and then they wonder what happened when the new refugee brought morality closes all the doors and brings their fun ride to its undeniable terminal end. Perhaps this is the Requiem for Europe and Christianity in the Western world, or at least in Europe. Requiem for Europe, somebody should write a song with this title, it would be appropriate to salute the death of a society. Truly some ideas never die even when they have long passed their use-by-date. The Oslo Accords are one such set of ideas which died the day that President William Jefferson Clinton handed to Yasser Arafat, after beating Israeli Prime Minister Ehud Barak into complete submission, everything he had demanded and Arafat walked out without a word and started the Second Intifada. It was later revealed that Arafat had planned the Second Intifada as the Palestinian answer to not getting their demands at the Camp David negotiations and still insisted that Israeli resistance to a common peace was the reason for the violence. Over a thousand Israelis were murdered and tens of thousands were injured, many with permanent and severe damage from the bombings with bolts and screws lodged permanently next to their spines, hearts and other organs or jammed into their brains all inoperable due to location. Many lost limbs, an eye or both eyes and other disfigurements. The Second Intifada, on top of Arafat refusing to make peace even after his terms were met, defined the situation and should have been the post mortem for the Oslo Accords. Arafat’s understudy and successor, Mahmoud Abbas, has often made clear to any willing to translate his Arabic speeches that the only peace he will allow Israel is the peace of the grave. As the pro-Palestinian protesters throughout Western countries chant ad-nauseam, “From the River to the Sea, Palestine must be free.” The word ‘free’ in this chant has a double meaning, the obvious that all of Israel is Palestine and secondly that every Jew will have been eradicated as Palestine must be Judenrein. Abbas has flatly stated even in English that should they be forced into accepting a shared state beside Israel, it will simply serve as the launching pad for the remainder of the conquest and eradication of the Zionist Entity. Even his saying Israel is difficult for this man and his band of minions. What is truly sad is not only the number of Western leaders who remain sold on the Oslo two states for two peoples principle; it is the number of Israeli military and intelligence leadership who also are still sold on these lies and deceptions. There never has been any Oslo agreement because the understanding of the two sides were as divergent as possible. Israel saw them as the opportunity for peace and cooperation and the Palestinian leadership, with the support of the Arab world behind them, saw it as taqiyyah, a deceit used against an infidel in order to advance Islamic interests and conquest. The concept of taqiyyah is well established and understood by any first year graduate student in Middle Eastern studies programs; and if not, they should find a different area of study. The problem is that peace is such a universal and central structure in Western thought and philosophies, as are negotiations and dealing honestly and forthrightly, that to believe that things are otherwise is difficult, though possible if one tries and concentrates on exactly what the other side says to their own people. What makes things more difficult is that the liberal leftist media and populations refuse to allow themselves, under any circumstance, to believe that peace might be impossible to attain in any situation. If the left today were faced with the onset of World War II, they would negotiate and negotiate until the free world consisted of some small atoll in the South Pacific surrounded by Japanese and German naval vessels, and they would be negotiating still. There is also the little fact that Israel is seen as the Jew amongst nations and as such has a separate and impossible set of expectations which are made worse by the leftist Jews, such as those who make up J-street and other similar groups, who also apply this absurd demand that Israel sacrifice and sacrifice with no end to how much or how far the sacrifice demanded be, as they are not the ones who will pay the price. Some have even gone so far as to claim, what do the Israelis have to lose in sacrificing for peace as they can always come and live in the United States. This is, in and of itself, an absurd piece of illogic not to mention, history has shown what happens when Jews face death and try to rely on the good graces of the Western nations. We recently read an article on Politico targeting Israeli Prime Minister Netanyahu over his disagreement with the outspoken and mostly retired military and intelligence corps, and how such a disagreement is leading Israel dangerously close to fascism. It was the author’s, and we trust the editors’ as well, that Israelis would be better led by its military and intelligence officers than under their elected leader. The article is titled Netanyahu vs. the Generals and went on and on endlessly stating the same tired logic as if repetition and quoting every last individual supporting the spitefulness against Netanyahu would eventually wear the reader down. The piece might actually be the opening shot across the bow announcing the candidacy of Ehud Barak for Prime Minister. Small hint to those in agreement, should Israelis have a choice between Ehud Barak and virtually any moderate or even extremist right wing politician, Barak would lose convincingly. Where his reputation is not nearly that of Guy Fawkes, the disasters attached to his time as Prime Minister preclude his ever holding that position for as long as Israelis have memories of his atrocious policy choices, of which the hasty and disorganized routing retreat from Lebanon is just the beginning of the highlight reel. For the record neither of us supported Likud and in one case, at least, Bibi Netanyahu was much of the reason why as there are numerous other Likud members who would very easily garner our votes, but that is up to the Likudnics to decide. We realize that changes take time, so time will tell. As far as peace with the Palestinians, we need realize that the term Palestinian once meant the Jews residing under British Mandate rule while at those times the Arabs were known as Arabs or Palestinian Arabs as compared to Palestinian Jews. One also need remember that this was during the period when both Jordan and Israel were simply the Mandate. 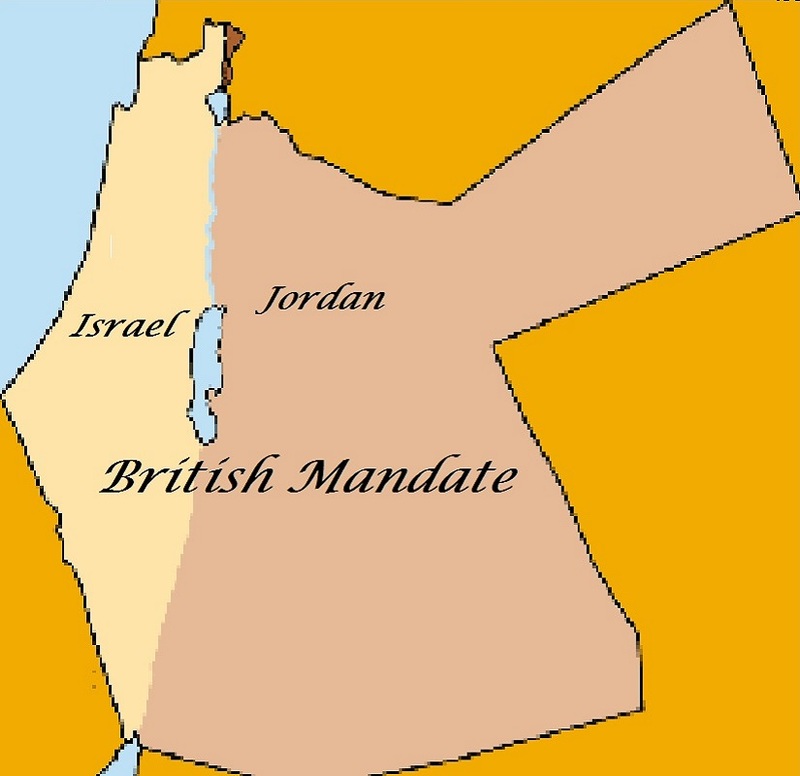 Eventually the plan was enacted and Jordan became the Arab State and Israel the Jewish State. The most obvious difference was Israel permitted Arabs, whether practicing Muslims, Christians, Jews or any other or no religion, to remain residing with full rights as citizens, while Jordan expelled any Jew ever to come within their area under their control. That was made most evident after they conquered by force of arms in an offensive war parts of Judea and Samaria, renamed it West Bank, and evicted every last Jew under pain of death, gifting their lands to people favored by the government and destroyed every Synagogue and Jewish religious academy within said lands. The adopting of Palestinian by the Arabs was just one part of their adoption of all of Jewish history with some simple adjustments in an effort to claim them and not the Israelites, the Jews, were the earliest surviving peoples from these areas. Anybody familiar with Judeo-Christian religions knows this to be a deceit and even more so if they are knowledgeable of Islamic and Arab history, as the Arabs did not venture forth from the Arabian Peninsula until the Seventh Century. That date is almost, if not, two millennia after the Israelites arrived from their Exodus from Egypt; one might be familiar with this as there is a book of the Old Testament with the same name. If we were to count from the times when Abraham first arrived in the land, we would need close to another half of a millennia if not more. Their deceit can only last as long as people continue to give their lies credence, which they do at their own peril. Such brings us to our next discussion, the awakening of the Western World. For most of the past century plus the casualty of Islamic violence has been the Jewish communities in the area of Israel both before the birth of the nation in 1948 and continuously afterwards starting with the invasion by multiple armies the morning of her birth. India and Russia had rather publicly covered conflicts and numerous African nations have also been subjected to violence as have much of the Balkans. Then there have been the intra-Islamic violence. It has only been the turn of the Twenty-First Century which has brought continued and sustained Islamic violence to the Western World. What is going to be instructive is exactly how the developed world reacts to the onslaught of Islamic violence. Of further interest will be whether or not their views and demands upon Israel are altered even in the slightest as a result of these experiences. Russia has shown Israel a fair degree of respect and freedom to act as necessary while not giving full measure as they also keep relations with the Muslim nations such as with Egypt, Saudi Arabia, Iran and Syria; for it is with Syria they hold their Mediterranean warm water Atlantic Naval ports. Beyond this, the longest standing restrictions on Islamic activities belong with Japan. Many are unaware but Japan has always refused Muslims permanent residence status in their lands. Further, Muslims may not own property, may not operate a business and the worship of Islam is banned. Needless to point out but no Mosque may ever be built on Japanese soil. Muslim tourism is permitted but any Muslim tourist caught conducting any form of Islamic instructions or otherwise attempting to spread the word of Islam is summarily and immediately deported along with their entire family; and if with a group, then the entire group is deported. The Japanese treat Islam as if it were a dread plague that once taking a foothold could threaten life on their islands. If the news is accurate, and we see no reason to disbelieve our sources, Cuba has recently refused permission for a Mosque to be built on their island, Cuba, that’s right, Cuba! Angola is but the first in alphabetical order of African nations enacting some limit if not outright ban on Islam. The world appears to slowly be awakening to the real face of Islam; a violent and unruly cult more desirous of ruling the world than of acting in what the rest of the world believes is a religious manner. Every other previous imperialist religion, Christianity, Shinto, Hindu and any others, have all been reformed and now stand side by side with all these religions seeking peaceful coexistence and mutual assistance. The exception to this rule is obvious, Islam. When Mosques are discovered in numerous countries to contain more rifles, grenades, bombs and bomb making material than prayer rugs and prayer books, then there is a definite problem. As the developed world realizes, along with the rest of the world, this threat for what it is, it is hoped that they will apply their learned knowledge to the situation in Israel. This could finally allow the solution which should have been applied immediately after the Six Day War, Israel attaining her originally promised borders, which includes the Jordan River to the Mediterranean Sea, and those previous Jordanian citizens and their families deported to the Arab nation of their choosing willing to receive them, or into Syria. The double standard cannot be continued after the truth has been driven home that Islam does not play well with others and is treacherous to the continued health of any nation it inhabits. What is good for the European nations and the world in general must, in all fairness, also be permitted Israel. To do otherwise is pure anti-Semitism, and this time that is an accurate accusation and an accurate application of the terminology.